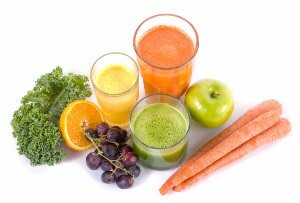 Juicing provides variety in your diet. While variety can indeed be the spice of life; sometimes it can also taste good! While each of us has particular favorite foods and comfort food that we eat more than others, can you imagine eating them with every meal? Extracting juice from fruits and vegetables provides a new and exciting way to follow a raw food diet, or infuse your current diet with life force. Scientific studies have proven that a raw food diet provides the optimum amount of nutrients and enzymes that your body needs. Why is that? Processing and cooking vegetables destroys vital nutrients and enzymes that your body needs, while freshly juiced fruit and veggies are abundant with nutrients and enzymes that are easy to assimilate. And if you're trying to lose weight, a diet consisting primarily of raw foods is your best option. That's because by satisfying all of your nutrient and enzyme needs, your body gets all the tools it needs to break down and digest fat. Without these tools, your body will waste energy and resources scouring your body for the energy it needs. This causes an imbalance in your body's physiological systems, and can result in various symptoms, including eating disorders and depression. While a diet of raw foods can certainly be tasty and satisfying, variety is indeed the spice of life. Sometimes you may need a raw food snack or a quick pick-me-up. How about the liquid concoctions in your supermarket? Many there are full of sweeteners, artificial colors, artificial preservatives, and other manmade ingredients that require a translator to read and a chemist to understand, not mention the fact they’re pasteurized (cooked) which destroys nutrients and enzymes. A tasty and healthy alternative to these store-bought concoctions is to make your own. Both fruits and vegetables can create a tasty liquid meal. However, you should keep in mind that fruit and some vegetable juice (carrot and beet) can increase your insulin levels. Insulin is a critical hormone that encourages our cells to consume glucose that flows through our bloodstream after eating, however too much insulin can be a problem. Nonetheless, raw fruit, carrot, and beet juices are still drastically healthier than most store-bought concoctions. Over time as your taste buds adapt you’ll be able to incorporate more greens into the mix while leaving out more of those sweeter fruits and veggies. You could also add fresh herbs to boost flavor and nutrition. After making your own delicious concoctions, one of the questions is what to do with the leftover pulp. While many people simply toss it out, there are better ideas. Instead, it's more practical to add the pulp to another recipe, perhaps a raw food nut and seed loaf, blended soup or stew, or simply return it to nature via your compost heap. The leftover pulp is also ideal for a worm bin providing food for the worms that will give you organic fertilizer in return. Do you want to learn more about this tasty and exciting form of raw foods? Then take a look at the articles below.